I was last at Caiola’s about five years ago and they opened about five years before that. I hardly remembered the little neighbourhood restaurant which boasts of many local ingredients, has a small bar which always seems busy, and emits the feeling of cool, relaxed, par-rustic atmosphere. On my last visit, I was practically a wee lad, but I remember liking the quaint feel of the place. I was excited to visit once again so I could have some more current thoughts on the Pine Street location. We were seated, watered, and menued without any delay upon arrival. The restaurant was somewhat busy, but not overly so except for the bar. I started by taking a look at the drink menu. The drink that immediately caught my eye was the Sour Rye – Gunpowder Rye, lemon, lime, hint of sweetness. I love local booze, I love whiskey, and I love citrus with my whisky, so I knew that would work perfectly. My wife went with the sangria. It was high time to scope out the food after our drink orders were placed. I saw a few choices that I knew would be excellent. My spidey sense took me to the Caesar Salad with fried spicy oysters and Caiola’s Burger which came with house made tater tots. Those choices sounded incredible, but my wife had her mind on the Polenta Fries with white cheddar dressing and red pepper relish. I agreed to share those, saving the Caesar for my next visit. I was a little nervous about the fries though since I’m not the biggest fan of polenta. After my reluctant agreement to share in the polenta, I checked to see if there were other entrees that looked interesting outside of the burger. When I saw the Hot Italian Sausage Pasta with red wine, broccolini, orecchiette pasta, and aged parmesan, I was torn between that and the beef patty party – if anything with bacon is a club, anything with tots is a party. I just couldn’t decide, but then our drinks came and I forgot momentarily about food while I sipped my whiskey whim. It was as glorious as I expected and exactly as described. It had full rye whiskey flavor with a super citrus slam, and truly just a touch of sweet. It was outstanding. The sangria had no shortage of sips from my significant squeeze. The wife finally decided on Chicken Marsala with roasted shallot, mushrooms, and rigatoni with red sauce and I was still confounded by my choices. When the waitress came to inquire about what we were going to eat, I told her to pick between the burger and the sausage pasta. She also was unable to decide, thinking that both were solid options. I told her just to bring me one and that would be fine. She walked away from the table and I could see the wheels turning. I knew she would make the right choice. My wife and I engaged in drink sipping and lip licking while engaging in some conversation about the Florida death metal scene in the 1980’s. It turns out she just couldn’t pick her favorite Florida death metal band. It was turning out to be a night full of indecision. Nonetheless, we were both excited to receive our appetizer and before long it came out. The polenta fries were stacked nicely and topped/surrounded with scallions and a drizzle of sauce. The dressing and relish were on the side. Despite my polentaphobia, I forked the fried cornmeal finger and placed it on my little plate. Then I took portions of both the dressing and relish and did the same. Once my polenta and such were properly plated, it was time to dig in to the fries with both accompaniments. They were much better than I expected – crispy on the outside and delivering a flavor I was unaccustomed to in the world of polenta. The pepper relish was good, but very mild, while the cheddar dressing was a little sharper and more flavorful. Both were very good on their own, but they were even better together, sort of like Hall and Oates. Our polenta went extinct and the next portion of our meals were soon produced. My surprise meal turned out to be the pasta. The burger would have to wait until next time. The waitress noted that the kitchen decided on my meal and that they definitively chose the pasta for me. Having been a cook back in the day, I know they know the food and I felt confident in their choice. Looking at my meal, I noticed a pile of little pasta ears with some sauce, meat and vegetables. My wife’s chicken and pasta sat in small puddle of sauce. We both put the food where our mouths were and tried our first bites. Mine was very tasty – not as spicy as I would have liked, but hearty with very crunchy broccolini and perfectly saucy. 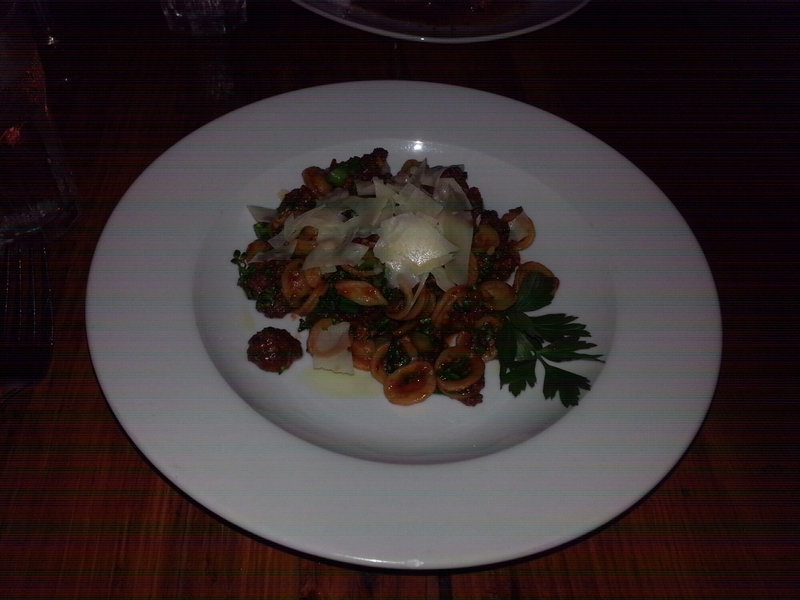 I loved the shape of the pasta as I did not know orecchiette before ordering it, but now that we came face to mouth, I was a fan. With only a bite or two of my meal down the hatch, my wife’s praise of her marsala had me clamoring for a taste. I tried it and I agreed that it was excellent. The meals were really, really good. We sat in near silence for many minutes, stopping only occasionally for a breath or a grunt, before finishing all the food on both our plates. As we finished, we looked at each other with a glimmer in our eyes and a tight belt, silently signaling that all was going to be just fine that night. Despite all the world’s problems, Caiola’s food had put us at peace and we could go on feeling free, though maybe just a little more buoyant. When the waitress came to take our empty plates, we agreed to look at the dessert menus. I didn’t fancy anything on the after dinner list, but I was already polent-y happy. The meal came to about 85 rubles after the show was over. It was a reasonable price for a nice night out with some excellent food. Caiola’s is a place I have to go to more often. It gets lost in the shuffle a little because it’s not new and it’s a neighborhood spot, but damn is it good. At the very least, I have to get over there before they get rid of that oyster Caesar salad…that thing sounds right delish. This entry was posted in Portland, ME food on September 26, 2015 by peterpeterportlandeater. Enjoy your reviews and usually follow up with a visit to reviewed restaurant . Review serves to remind me how many good eating places we have here in Portland area. Thanks.